Santa Monica College (SMC) animation student and multimedia fine artist Cat Ramos drives through Downtown Santa Monica’s 20th St. on a typical Southern California weekday afternoon in her green 1995 Isuzu Rodeo Trooper. Just ahead of her, a red and blue cement truck chugged ahead. Then, a light bulb of creative ideas went off for Ramos. Three semesters and two independent studies later, the result of that afternoon drive is “Harvey Marcus,” a four minute short film selected to premiere at the TCL Grauman’s Chinese Theater on Sunday, November 18th, from 11:30 to 1:30 p.m. “Finally, I’ve gotten some recognition with the art I do,” says Ramos. 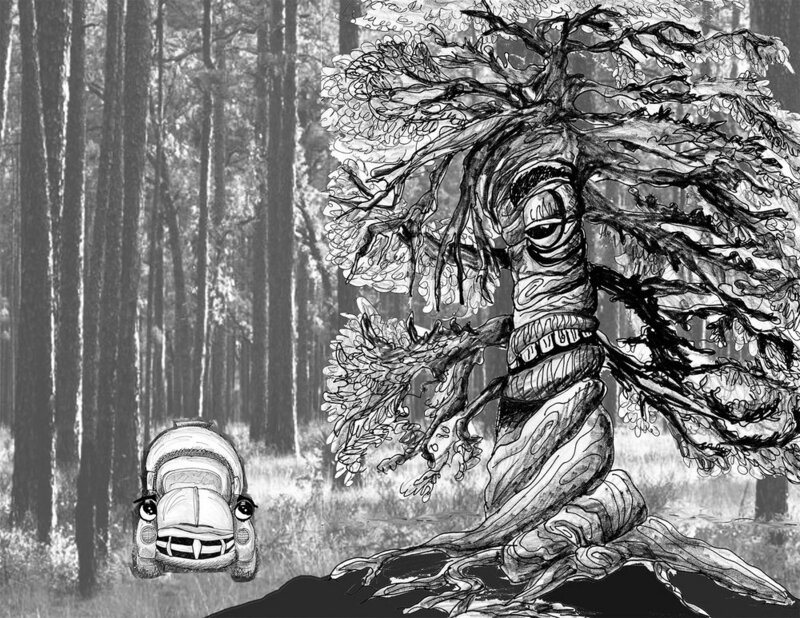 The simplistic, black and white short animation is part of the 12th Annual L.A. Skins Fest, a Native American film festival dedicated to celebrating Native-made movies, filmmakers, industry professionals and musicians. The plot centers around a personified 1930s cement truck, Harvey Marcus, who can feel his surrounding environment and hear plants calling to him. Marcus has one job, to cover and protect the plants, who are suffering from the ills of an industrialized world. After Marcus’ owner, a grumpy construction worker named Butch, dumps him for coming to a dead stop, the truck is saved and transformed into a compose vehicle with solar panels by a American Indian woman, Puuti. "Marcus and Puuti work together making beautiful gardens and planting more trees, contributing to the harmony of life on Earth,” explains Ramos. "That was my message, let’s look at things and make (them) better for our world," continued Ramos. The concepts featured in “Harvey Marcus" were originally hand-drawn by Ramos herself. Half of the final cut is scanned from her original renderings, while the other half is completely animated. “It has a sketchy feeling to it,” adds Ramos. “It’s not cartoony especially, (but) more a black and white type of art," explains Ramos. Voiceover artist Brandon West, who plays the part of Butch in “Harvey Marcus,” is the short film's only cast member beside Ramos. Better known as “LA CAt” throughout the entertainment community, Ramos has always been filled with creativity. She grew up as a gymnast in the San Fernando Valley, were she began dancing at California State University, Northridge. After graduating in 1982 with a Bachelor’s Degree in Fine Arts and Dance, Ramos entered the professional music industry. She landed her first big roles as “The Cat” in George Clinton’s 1982 R&B hit “Atomic Dog” music video, and was a dancer in LaToya Jackson’s 1984 R&B album “Hearts Don’t Lie.” After a few years in the dance industry, “LA CAt” tried her luck as an artist. Her career move paid off, as Ramos toured as a bandleader through Singapore, Thailand, Hong Kong, China and Mexico City during the 1990s. When the 2000s hit, she faced the challenges of a new digital age.